(Jakarta, January 27th 2014) – With Chinese New Year on the horizon, Archipelago International have launched a group-wide promo throughout the month of January to honor the traditional Chinese holiday. Running for the month of January, guests staying at all of Archipelago's hotels are given the chance to win select prizes upon check-in. 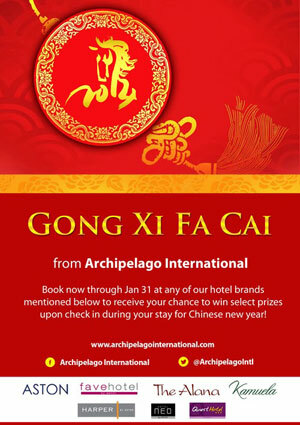 The “Happy Chinese New Year” promo sees each of Archipelago International's hotels and villas offering their guests a chance to win a reward at the front desk. As guests check-in, they are invited to pull a piece of paper from a bowl (one per room) in the hope of picking a winning ticket with a select prize. Prizes include instant cash and instant discounts on the room rate, free upgrades and vouchers for a free night on the next stay, 25% off spa treatments, complimentary mini bar, 50% off lunch or dinner, free breakfast, a branded pen or T-shirt and a flower or fruit basket in the room. There are also electronics and other premium gifts, as well as free airport drop off, a romantic dinner and vouchers for nearby activities in the area. “This exciting promo is our way to give something back to our loyal customers, whilst also celebrating the festivities of Chinese New Year. Not only do we hope to promote Archipelago International's hotel brands, but we also aim to provide a fun holiday and fantastic prizes for our guests” Says Norbert Vas, VP Sales & Marketing Archipelago International. More details of the promo can be found online and on the hotel booking pages, as well as within e-blasts, social media pages and online banners.